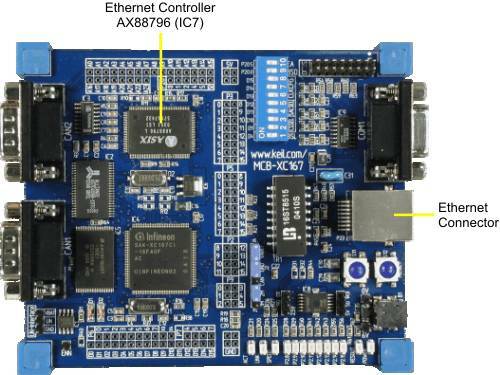 The Ethernet Interface on the MCBXC167 NET board is a standard 10/100 BASE (10/100 Mbit) interface that allows direct connection to most Ethernet networks. The Ethernet controller AX88796 (IC7) interfaces to the Ethernet connector. The CS2/ chip select from the XC167 microcontroller accesses the Ethernet controller as a memory mapped device.